Raise your hand if you’re a lip balm-aholic! I can’t be the only one. I used to go through several tubes of balm on a monthly basis, all in the name of moisturized (and oh so kissable) lips. But then one day, I had my aha moment. It involved turning the tube over and reading that the number one ingredient in my beloved balm was petroleum. Eek, no thank you! 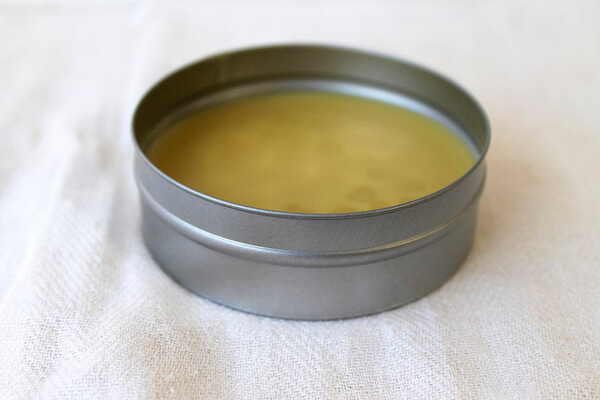 So, after I said “bye bye” to my conventional balm, I got to work figuring out how to make it on my own. It didn’t take me very long to perfect the recipe, which I now happily share with you. It takes just 4 ingredients, y’all! 1.) Fill a saucepan with water and place a glass bowl on top of it. Slowly bring the water to a boil. 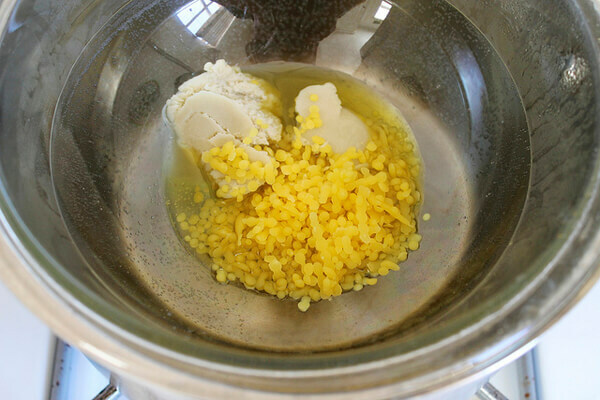 Fill your glass bowl with the shea butter, olive oil, and beeswax and stir with the chopstick until completely melted. 2.) Remove your glass bowl from the hot water, and add in your peppermint essential oil. Mix once more with your wooden chopstick – making sure to break down any bits that may have hardened on the side of the bowl. 3.) Pour mixture into your container(s) and let sit until fully solidified (takes about 20-30 mins). Your lip balm is now ready to use! *If you aren’t into peppermint or want to try another flavor combination, simply substitute in any other high quality essential oil. You could make a lavender rose or even a cinnamon flavor. Thanks for publishing this wonderful, yet simple recipe Lisa :) I wonder if the mixture will still solidify here in India where the weather is too hot (round the year)? Hmm, I have this problem with all my coconut oil based recipes. But I think I can help! You’ll need to up your beeswax in order to keep it solidified, maybe even double it. You could also keep the balm in a cooler area of your home/place of work. I hope that helps, Jane! Great question Jane. I grew up in Arizona and remember our lipsticks and lip balms melting in the summer either in our purses or when you go to apply – oy! I would put them in the refrigerator to get them to solidify again. That is great advice Becca! Thanks for sharing and let us know how it works for you Jane.